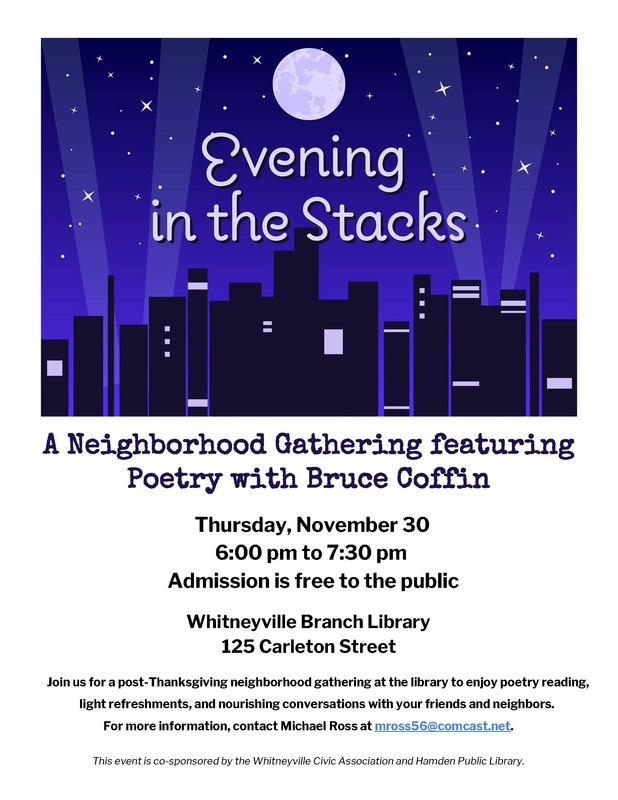 Please mark your calendar for upcoming neighborhood events at the Whitneyville Branch of the Hamden Public Library. We hope you can attend these free events to celebrate our local authors and local library! Both events at the Whitneyville Branch Library, 125 Carleton Street, and are co-sponsored by the Hamden Public Library and Whitneyville Civic Association. Welcome. President Dave Bechtel welcomed everyone to the meeting and introduced the Board members and Committee chairs. Dave announced, on behalf of Library Committee, that the library event held in the spring raised $2,443, and Maureen has gotten the funds and has started to allocate it for use. Committee Updates. Mark Foran gave the Traffic committee update. In light of all these apartments going in on Mather, Mark did three days of car counting to get a baseline to see how traffic is impacted once they are fully opened. Also discovered that the average speed on Mather is 36 mph. Highest was in the forties, but most were in the mid 30s. Speed is an issue, while capacity is not. Mark’s suggestion was speed tables on cut-through streets. The bridge over the canal can be dropped to help with safety. And the service road could be permanently open to relieve traffic on Mather. A Music Jam recap was given by Former President Jan Kazienko. The three concerts went very smoothly. The anchor musicians were given money for the first time and this was appreciated. The committee will have a wrap-up meeting where we hope to have more new ideas. Secretary Deirdre Dolan gave an update on progress with the National Wildlife Foundation’s Backyard Habitat project. Five Whitneyville residents have already expressed an interest in getting involved in the project. There is a sign-up sheet for anyone else who would like to join the committee. So far two yards in Whitneyville have been designated as certified Backyard Habitats. We will have to officially register Whitneyville and have a consultation with an National Wildlife Foundation representative to find out how many homes, parks, and public buildings will be needed to qualify for Community Wildlife Habitat status. It costs $100 to register, so that’s something the committee will need to do: raise the registration fee. Only two CT towns are currently certified: Willimantic and Colchester. There’s a piece of information we are really going to need and can’t find: how many people live in Whitneyville? Many in attendance recommended using Census tract data. Guest Speaker. Dale Kroop, Hamden’s Director of Economic and Community Development, gave an update on economic development work in the neighborhood. 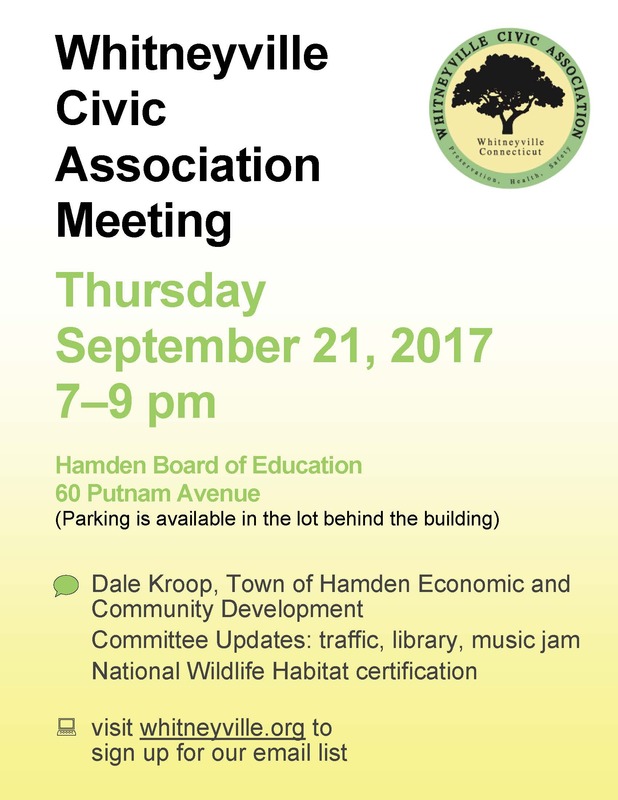 He suggested that citizens visit his website, http://www.hamden-ct.com/default.asp or email Dale at dkroop@hamden.com to sign up to get his emails. Dale said the retail marketplace forecast is that by 2022 most shopping malls will be closed. By contrast, Hamden has the lowest retail vacancy rate in the region. First Niagra building is now under contract with a New Haven boutique. On Mather, 80 units of affordable housing in a low-rise building are being built across from the larger apartment development. Other new businesses are going in as a result of the new residential development on Mather. The town’s job is to balance the needs of people and the marketplace. Putnam Place Plaza, where Stop and Shop was located, is left with a big hole. The Shopping Center owners are looking for viable tenants who will be able pay their bills. Location, demographics, and zero foot traffic (nearby homes and businesses) may call for alternative uses, for example, a school or nonprofits. Secretary Deirdre Dolan had to leave, but made a quick announcement: Leonard Young, 12 Augur Street, belongs to Gimme Shelter which raises funds & awareness for Hamden’s Animal Control Gift Fund to design, build & staff a new Animal Shelter. Their next event is this Saturday and it has a Whitneyville theme: wines from Wine 101 and food from Le Petit Gourmet! The event will be from 2 – 4 PM at a private residence on Blake Road. See the flyer on the other side of the dais for more information. Vice-President Connie Matheson resumed taking minutes for the remainder of the meeting. Dale Kroop continued his overview of economic development projects on Dixwell Avenue. He discussed a number of completed projects and reviewed the scope and status of vacant buildings and properties. He summarized the history of the former Hamden Middle School site and presented details of the current redevelopment plan including 57 units of mixed income housing, a community center and the abatement of the contaminated elements of the site. He then switched to Whitney Avenue speaking mainly about the repurposing of the Centerville Lumber site. Dale stated that about 50 percent of his time is spent on small business development, coaching (some of our Whitneyville business owners were mentioned) and working with “solopreneurs” in nine industry clusters that meet several times during the year. He closed by suggesting that we check out his website for full details. LED Street Light Update. Bob Pattison and Christina Crowder, from Spring Glen Association, gave an update on the work that they have been doing with regard to the LED street light conversion proposed by United Illuminating (UI). Their research has presented further concerns about what the “right’ fixture would actually be. They have also spoken to towns who have been able to purchase the light fixtures from the utility and contract privately for maintenance, recognizing about a 50% savings. They have a proposal in front of the Mayor and hope to meet with him soon. A public meeting on this topic is being planned. Adjournment. Dave adjourned the meeting at 9:30. Mayor Curt Balzano Leng will be hosting a “Mayor’s Night Out” event on Monday, October 23rd, from 6pm – 8pm at the Board of Education Headquarters, located at 60 Putnam Avenue, Hamden, CT 06517. The Mayor will be available for dialogue and citizen input on neighborhood as well as Town-wide issues in an informal coffee hour type setting. ALL Hamden District and At-Large Legislative Council candidates and Mayoral candidates have been invited to participate in the LWV Legislative Council Candidates Forum and Mayoral Debate on Oct. 26th at 7:00PM in the Thornton Wilder Auditorium, 2901 Dixwell Avenue. Ray Andrewsen, General Manager and Morning Show Host of Quinnipiac University’s community radio station, will moderate the event. The 1st part of the evening will be devoted to the Legislative Council District and At-large candidates. Each candidate will be introduced and have 2 minutes to name the district they plan to represent and state the reason they are running. The second part of the evening will be devoted to a Mayoral debate between Democratic candidate Curt Balzano Leng and Republican candidate Salman Hamid. PLEASE ATTEND! Residents will be encouraged to submit their questions on local town issues at the debate The questions will be asked of the candidates by the moderator. Learn about your candidates! Ask questions! Get Answers! Mixed-income communities build stronger communities and living in these communities has contributed to educational and economic successes and expanded opportunities for all. Acknowledging this, the State of Connecticut passed legislation that dictates that 10 percent of housing in the state meets the affordable standards as established by the state. The developers of Canal Crossing are building luxury apartments on Mather Street. In order to get approval for this project, they took advantage of the affordable housing law outlined in 8-30g, which allows a developer to build multi-family housing in a location not zoned for multi-family housing. In order to get approval under 8-30g a developer must provide affordable housing in 20 percent of their units at that location. Now, with the project starting to lease apartments, they are asking the Planning and Zoning Commission to allow them to eliminate any and all affordable housing they were supposed to provide on Mather Street and put that number of units at their Mix Avenue property instead. We see value in the affordable units at the Canal Crossing location and cannot support the reassignment to another location that perpetuates economic segregation. At 7:05 the meeting was called to order by President Janet Kazienko. Tonight is Janet’s last meeting after her two years in office. Janet thanked the board and said she learned a lot on the job, but she’s happy to be passing the baton. She said her husband, especially, is relieved her tenure is over. Conflict with Ridge Hill PTA meeting. Our meeting will potentially move from the 2nd to 3rd Thursday of the month. Library Fundraiser. Dave Bechtel said the Library fundraiser brought in $2000, and was a lot of fun and great for the community. Maureen Armstrong will work on a check ceremony with the town library board. New trees were recently planted as part of the refurbishment. Treasurers report: $1,664.81 and $3,848.82 in our accounts, including the library fund raiser monies. Dave Bechtel was unanimously elected President. Connie Matheson was unanimously elected Vice-President. Guest Speaker. State Representative Michael D’Agostino spoke. D’Agostino is still trying to change the mechanism for distribution of state funds to schools. The state was ready to announce the new budget, when it learned that quarterly-filer taxes were seriously below projections. Now looking at a 2.5 billion dollar deficit. Over the years, the state did not regularly put money aside to fund the pension obligation. Little is left for discretionary spending. The political reality is that taxes are unlikely to be raised. However, there could be a sales tax increase and regional tax assessments, as are done in other states and are being discussed. No matter what else happens, educational taxes pay for more than just math and English teaching, so Rep. D’Agostino is hoping funds can be diverted from other pots to communities that need it. Budget cuts will hurt state workers who may be laid off, resulting in depleted services and municipal aid. We might not have a budget on June 7, which would give the governor plenary power, and might not be a bad thing since he is not running again. Deirdre Dolan asked if legalized marijuana or toll roads are being considered as potential revenue sources. “Legalized marijuana is interesting,” Rep. D’Agostino said. “I think it will come back into the budget because the money will just end up in Massachusetts or Vermont.” Toll roads could also happen but the money can only be used for transportation which would make the transportation fund solvent, perhaps $100 million in the first few years. Reps from border towns like Danbury don’t like them. Closing the hedge fund loophole will not happen. No appetite in the Senate and the Governor will veto that. Connie Matheson asked, “Should we be making phone calls to support your formula for fairly supporting all the schools?” D’Agostino suggested calling Martin Looney to make sure Hamden gets its educational funding. Courts found that the way Connecticut distributes its educational funds is unconstitutional. This case is now at the state Supreme Court, and the new methodology Rep. D’Agostino is working on would change the formula so ring suburbs like Hamden would get more funding. The new formula forces districts of 1,000 or less students to join with larger districts or lose their funding. Michael Ross noted that we are going to have 380 new households when the new development at Mather and Dixwell opens. What kind of impact will that have? Rep. D’Agostino said it will trigger redistricting as well as adding taxes to the town pot. But a lot depends on whether some of those kids have special needs. The new development is not family housing though; the units are small, single bedroom efficiencies. Adjournment: President Bechtel adjourned the meeting at 9:00.